ROGUE RIVER, OR (July 2010) – Wagner Electronics (www.wagnermeters.com) Wagner Electronics announces the release of the new generation of Rapid RH®; the RapidRH® 4.0. 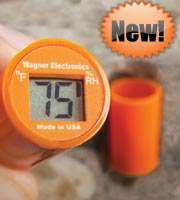 The new RapidRH® 4.0 utilizes the new Easy Reader featuring Wagner’s patent pending Touch-n-Sense™ technology, making it easier than ever to use Wagner’s Rapid RH®method for measuring relative humidity in concrete slabs.As with the original Rapid RH® Reader, the Rapid RH® 4.0 Easy Reader is designed to make relative humidity readings on any job site fast and accurate. The new Touch-n-Sense™ technology means the Easy Reader goes to work instantly when inserted into any Wagner 4.0-version Smart Sensor. On contact, the Easy Reader will turn on, take the reading and can be immediately removed from the test hole. The Easy Reader will then continue to display the relative humidity and temperature for 5 minutes before turning itself off or until it is inserted into another Smart Sensor. And of course, because the Smart Sensor remains in the test hole, the Easy Reader can be moved from test hole to test hole for instant and repeated measurements and NO equilibration time. With the Rapid RH® Easy Reader, getting fast and accurate relative humidity readings just got easier.